When you save a document in your word processor, your work is encoded in a particular file format. You often have a choice of formats that you can use, with names like DOC, DOCX, RTF, WPD or ODT. Your choice of format will influence whether others can easily read your document today, whether you yourself will be able to read your document ten years from now, and whether you will be able to migrate painlessly to another word processor or operating system if and when you choose to do so. Although many users simply click “Save” and give no thought to which format is being used under the covers, this unthinking use of the word processor’s default settings is a recipe for vendor lock-in. In fact, several vendors intentionally set their default format to be ones which will only work well with their own software, fostering dependency on that vendor’s software and lessening the user’s ability to take advantage of other options in the market. The more documents you save and accumulate in a vendor’s proprietary format, the harder it will be for you to consider any other choices. The objective of this paper is to show you, the user, how to extricate yourself from this cycle of dependency and take control of your documents. Specifically, we show how you can, in three easy steps, free yourself from a Microsoft Office dependency. In the end you may, of course, choose to remain on Microsoft Office. You may decide to migrate to an alternative word processor. That, in the end, is your choice. But by following the three steps outlined below, your freedom of action will be preserved, and your choice of word processor will be based on your priorities and your needs, and not forced on you by your current application vendor. The older versions of Microsoft Office, Office 97-Office 2003), by default save documents in a family of binary formats with the extensions DOC (Word), XLS (Excel) and PPT (PowerPoint). Although these formats are proprietary Microsoft formats, over the past decade 3rd party applications have developed the capability to read and write these formats. However, starting in Office 2007 Microsoft suddenly switched the default format to something called Office Open XML (OOXML). This format is not widely supported outside of Office 2007. So if you save a document in the OOXML format you make it harder for anyone else to read your document unless they are also using Microsoft Office 2007. In almost all cases, the same document, if saved in the legacy DOC format will be more interoperable. Staying with the default choice, OOXML, only restricts your choices and make you more dependent on Microsoft Office. Of course, that is why Microsoft made OOXML the default format. The first step to liberate yourself from Microsoft Office dependency is to change the default format in Microsoft Office 2007 away from OOXML and back to the early binary formats supported by Office 97-2003, which are widely supported by 3rd party applications. This is a neutral step that preserves the status quo. By making these changes you will still be able to read and edit any OOXML documents that are sent to you, but all new documents you create will be saved in the more widely supported DOC/XLS/PPT formats. If you are using Microsoft Office 2003 or earlier, then you should skip this Step and move on to Step 2, since OOXML is not the default format in those earlier Office versions. 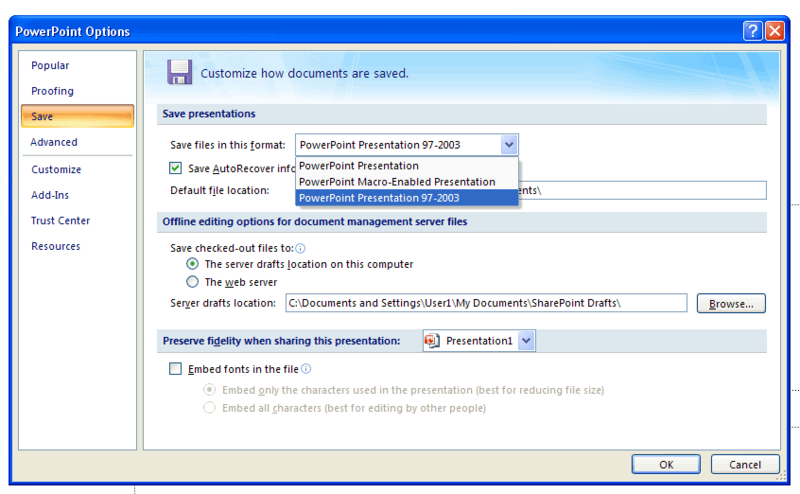 To change the defaults, you will need to load Word 2007, Excel 2007 and PowerPoint 2007 and follow the following steps. Click the Office Button (the unlabeled logo button in the upper left of the program). Click “Word Options” at the bottom of the dialog. Go to the “Save” section. 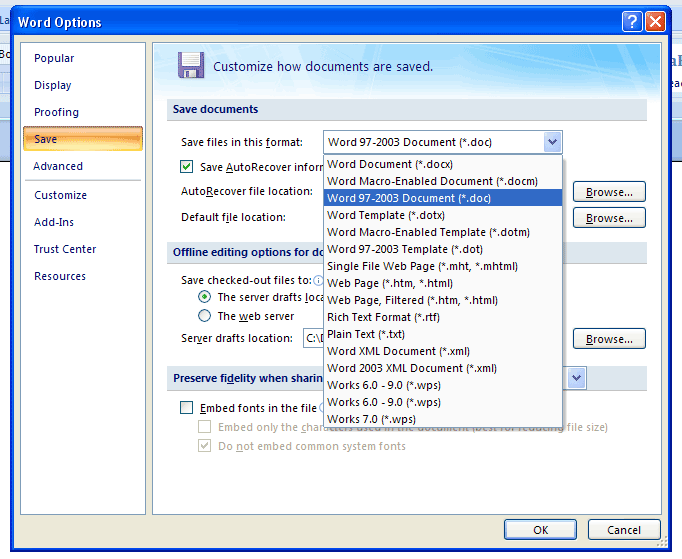 For the “Save files in this format” setting, choose “Word 97-2003 Document(*.doc)”. Click “Excel Options” at the bottom of the dialog. 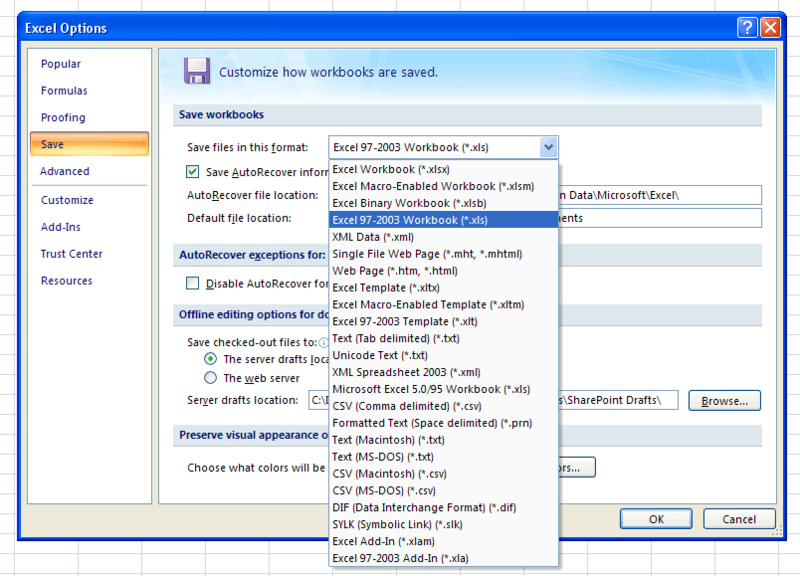 For the “Save files in this format” setting choose “Excel 97-2003 Workbook (*.xls)”. Click “PowerPoint Options” at the bottom of the dialog. For the “Save files in this format” setting, choose “PowerPoint Presentation 97-2003”. Now that you’ve made the first steps towards taking control of your documents by preventing the lock-in effects of the OOXML default, it is time to take further control. You’ll now want to enable OpenDocument Format (ODF=ISO/IEC 26300) support in Microsoft Office, so you can save and exchange documents using the free and open International Standard while remaining in the familiar Microsoft Office interface. ODF is an XML-based, open document format standard, designed to be platform- and application-neutral and support interoperable use across applications, eliminating vendor lock-in. ODF is supported by many applications, including office suites from Sun, IBM, Novell and Google, as well as open source projects like OpenOffice, KOffice and AbiWord. Additional applications supporting ODF are listed on Wikipedia. Microsoft Office does not currently support ODF “out of the box”, but you can enable ODF support in Office by installing a “plugin”, sometimes called an “add-in”. A plugin will add additional options or menu items to the Microsoft Office UI, allowing you to open and save documents in ODF format. In some cases you can even set ODF as the default format for new documents. Sun Microsystems has published an “ODF Plugin for Microsoft Office” which supports Office 2000, XP, 2003 and 2007 SP1. Microsoft has announced that Office 2007 Service Pack 2 (SP2) will enable ODF support in Office 2007, but this code is not yet available. Step 2 is to evaluate and adopt a plugin to add ODF support to Microsoft Office. Start using ODF now, saving your documents in the open standard document format. This allows you to remain in Office, for now, while building your familiarity and comfort level with ODF. The plug-in approach is a transitional approach. It allows you to continue working in Microsoft Office while you enable ODF support side-by-side. But at some point you will want to consider your options. Maybe you find that converting back and forth to ODF format in MS Office is slow. Maybe you are using Office 2003 currently, but want to avoid paying for an Office 2007 upgrade when mainstream support for Office 2003 comes to an end on April 14th, 2009. At some point you will want to move to an application that supports ODF natively. You are free at this point and have a wide variety of choices. You can stay on Windows or consider moving to Linux or the Mac. You can stay with a traditional client editor, or move to a web based editor. You can use commercial software, or use open source software. The important thing is that you have taken control of your documents. You are no longer dependent on Microsoft Office and its file format. You have broken free of the vendor lock-in. You are free to choose an alternative word processor when you want to and if you want to. Until then, be comfortable in knowing that you are keeping your options open while remaining in control of your documents. This paper is also available in ODF and PDF formats. Thank you very much Mr. Weir ( by the way is Peter Weir, the film director, related to you? ). Isn’t what you’re suggesting exactly what Microsoft has been pushing for the past decade? That people should save files in the undocumented .DOC format because it’s so widely used? @Gary, I see this as similar to the arguments for and against handing out clean needles to drug addicts. Does it encourage drug use? Or does it encourage safety? I’d make the same reply: “If you are not using Microsoft Office now, then do not start. But if you are using it, then here are some tips for using it safely and for eliminating your dependency”. I’m thinking of it like a public health issue, not dogmatically. @Sebastian, no known relationship to Peter Weir. If I were related I’d ask him what the hell “Picnic at Hanging Rock” was all about. But I believe I am related to Thomas Weir, who was burned for witchcraft in 1670. Heresy runs in the family, it seems. I disagree of course, but I won’t bother to elaborate because our respective positions are pretty well-documented already. "The important thing is that you have taken control of your documents. You are no longer dependent on Microsoft Office and its file format. You have broken free of the vendor lock-in." But I fail to see how you can disagree with this — it is a statement of fact. Aside from the word 'important', what is there to disagree with? @Rob, thanks for writing such a simple and easy-to-understand document. The only comment I have is that you might want to include more information on how people can actually get the ODF plugins installed — at least provide a link or two, so the information remains current. I was quite impressed by how you managed to stay out of the trap of Microsoft-bashing. The only place you slipped, that I noticed, is when you say "Of course, that is why Microsoft made OOXML the default format." Whether that's true or not, I don't think you can really assert that — it sounds a little bitter. P.S. Why on earth can't I use <q> tags?! My guess is that Doug and I could agree on the facts, but disagree on the interpretation. Remember, vendor lock-in, from the vendor’s perspective, is a very profitable business model. I do have links to the two existing ODF plugins, in step 2. Office 2007 SP2 doesn’t exist yet, so there is nothing I could link to. Downloading the Sun version is easy — from the home page click the “Get it Now. FREE” link. Kinda stands out. For the CleverAge one you need to did deeper. The download link is not on the homepage. You need to go to the download tab. Pre-req’s and install instructions are there as well. This blog uses Blogger as the comment engine, so we’re limited to the HTML subset they allow in comments, which appears to exclude q’s and blockquote’s. Not sure why. IMHO you missed the first important step and that is to unhide the extensions for known file types. I would suspect a lot of folks unknowingly send these .docx, .pptx, .xlsx files without realizing they’re not sending a format all can read. Is docx actually ooxml? I thought it wasn’t? I know this was a pretty specific post, but there are other alternatives too. Such as tex and it’s family, html, or even plain text which suit various specific purposes far better than any ‘wordprocessor’ format or application. And all of which are out of reach of vendor lock-in. (after having used some alternatives, the notion of using a ‘wordprocessor’ fills me with a certain degree of horror). “OOXML” is a non-specific reference to a range of formats that includes Ecma-376 1st Edition, ISO/IEC 29500, Ecma-376 2nd edition, as well as to the undocumented format that Microsoft Office 2007 actually writes out, which is not identical to any of these published standards. Fair point about formats like TXT, HTML or Tex, but they don’t help much for spreadsheet or presentations. OxygenOffice (OpenOffice on steroids) added to Puppy Linux 4.31 (multiple newer and customized versions exist as well) brings one a small, fast, and user-friendly business-quality desktop/laptop resource with a fraction of the hassles of anything MS. Why anyone would voluntarily waste their time with MS products any more is a mystery to me!